Why not challenge yourself, your friends and family to do 22 press ups for 22 days in support of veterans' mental health and PTSD. 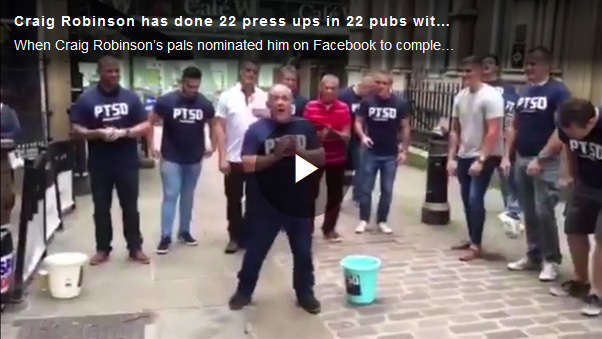 Taking part in the challenge is a fantastic way to raise awareness of veterans' mental health and PTSD, and to raise money for PTSD Resolution. Increasing numbers of veterans are coming to PTSD Resolution every year for help with mental health problems. Every donation brings us closer to returning a serviceman or woman to a normal life. a. Your hands and feet should be just wider apart than should length, with your weight evenly distributed between your wrists and the balls of your feet and back straight. b. It's both better for you and easier to lower yourself down slowly whilst inhaling, then explode upwards on the exhale. c. Watch for the easy cop-outs: always keep your elbows tucked in and don't let your hips either sag or rise. Thanks so much for your support! Good luck.